The Samsung Galaxy Chat, released in July 2012, is the least expensive of the Galaxy series offered by Samsung. It offers a simple and streamlined user experience at very low cost in order to put a Galaxy model phone in every price range. If you own this mobile phone and notice an increased number of hangs, freezes, unresponsive programs and other problems, it could be time to reset the phone. There are two kinds of resets that you can perform on the Galaxy Chat B5330: the soft reset is a simple off/on switch that you can use when the phone becomes unresponsive, while the hard reset actually reinstalls the operating system, erasing your personal data and restoring the phone to its factory settings. If the first method is a bit less intrusive, the second one vouches for better results. The Galaxy Chat is designed for the user whose priority is messaging. 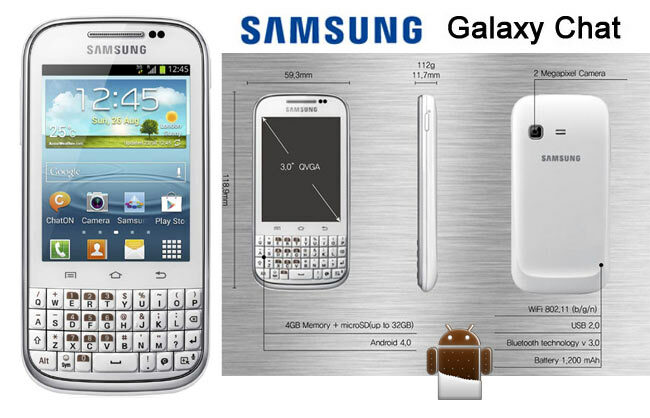 The included QWERTY keypad and range of instant messaging features are welcome additions to the Android-powered phone. Other features, such as the 2 MP camera, have been scaled back in order to provide the most affordable and streamlined user messaging experience. The phone carries a 4 GB internal hard drive that can be supplemented by an additional 32 GB available through the MicroSD card slot. The MicroSD card can be used to store a backup of your personal information, but must be taken out of the phone before you start the hard reset procedure if that is the case. There are multiple ways to perform a hard reset, and all of them will erase your personal data from the phone in the process. Some of these methods do not issue any warning before the process begins, so it’s very important to know beforehand that you have a backup ready and your MicroSD card taken out. Alternatively, if you’d like to clear the card as well, you can leave it in but only if you have made your backup on another device. When the phone stops responding, hold down the power button for 10-15 seconds and wait. The phone will turn itself off and back on again. Select Reset Phone, then Erase Everything. Follow the on-screen instructions from this point and the phone will reset itself. Start with the phone off. Press and hold the Volume Up and the Power Button until a logo appears on the screen. Use the volume buttons to scroll to Wipe Data/Factory Reset and select this option by pressing the Power button. When it asks for confirmation, select Yes. Now wait for the phone to reboot and that’s it. This code will force the phone to reset, wait until it turns back on and restore your user data.